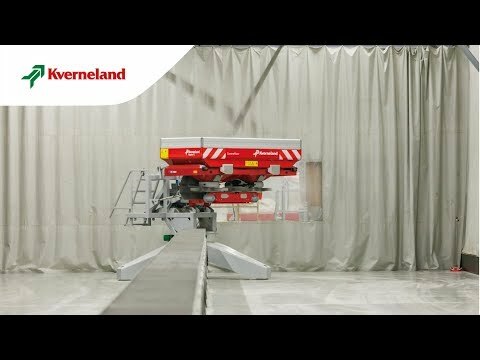 The ultra-modern test facility in Nieuw-Vennep, The Netherlands, accommodates a high tech testing set up for accurate spreading charts for Kverneland spreaders. The test faciliy is unique in the market because of its highly advanced 3D test system and software set up, to analyse the results of many fertilisers in combination with our spreaders. It facilitates also more environmental friendly testing with focus on saving fertiliser, energy and fuel. The spreader and fertiliser test facility enables us to further grow in new developments and analyse the effect of new features on the spreading pattern of the spreader in a very quick and modern way. ...gives the best results on wider working widths, even up to 54 meter. The spreader and fertiliser test track consists of a robot with 3-point linkage, which can turn the spreader 280 degrees around and spread fertiliser into maximum 80 catchment hoppers. These hoppers can individually weigh the fertiliser by using weighing cells of 5 kg each. The spreading pattern is monitored from the control room and analysed by 3D software. Afterwards emptying the catchment hoppers is done fully automatically. The used fertiliser is transported by a conveyor belt to a separate storage container.